...that about half of the property owners were not notified in time ... their protests and that the property assessor's office had forecast property assessor's office had forecast property value reductions of 50% yesterday held up action by the city council on a permit for the con(unreadable) of a Catholic school at East Thirty-ninth street and Laddington street. John A. Murray told the council ... survey he had made showed ... from one-third to one-half of ... property owners did not know the ... was to be considered by the council last week because they had not been notified by the city and that ... notice had been sent to a ... who had been dead for three years. City Auditor Funk explained ... the list of property owners had been furnished by the petitioners for the school. ... Murray also said that the county assessor's office had told the property owners that if the school was placed there the property in the neighborhood would be depreciated up to 50% for taxes. O. Laurgaard, city engineer, a property [owner?] in Laurelhurst, declared that ... generally have depreciated the value of the property in their immediate district. Additional remonstrances against the permit for the school were filed by the property owners, who said that they had at least 70% of the [owners] against the project. The pro(unreadable) were referred to Commissioner ... for investigation. Mr. Murray also contended that the ... has enough schools and that ... of the children would be drawn from as far away as Montavilla. He ... that a mortgage company would had interests in Laurelhurst was opposed to the school on the ground of property values would be depreciated. It is true that churches and schools have depreciated property, ... council has been responsible for the depreciation of a great deal of property in the city, ... for we have ... that churches and schools have ... to enter residential districts," said Mayor Baker. "The statement ... the county assessor's office has ... that the property in Laurelhurst would be depreciated about 50% is a serious statement. It raises a question as to whether this council wants to change its polity in the ... of granting permits for the ... of churches and schools in residential districts over the protests of the property owners." 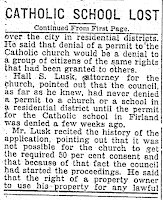 City Engineer Laurgaard declared ... member of the Catholic church was opposed to the granting of the permit and that the late Archbishop Christie had been opposed to the construction of a school at that place on ... ground that it was not a proper place for a school. Dr. Banner Brooke declared that its investment of the property owners in the district were half a million dollars and that the benefit to a few children who would attend the school were not sufficient to overcome the ... that the se property owners would suffer because of he school, as did ... Roberts and others. 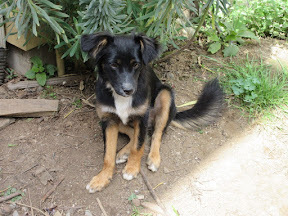 It was declared that the school would not be needed by more than 30 children. Mr. Laurgaard declared that the records would show that property had depreciated heavily adjacent to schools all over the city, and that in Laurelhurst lots adjacent to the present site of the Laurelhurst school had been offered for less than half of the price of lots some little distance away. Some of the property owners in(unreadable) that, since the present proceedings came about through the inti(unreadable) of the city council, the council must determine whether the location is a proper one for the school without regard to what the church or the property owners might say about it ... contended that it was not a proper place because of the traffic conditions on East Thirty-nine street, because the church would not have sufficient room and because of its effect upon the neighborhood. Hall S. Lusk, attorney for Archbishop Howard of the Catholic church, yesterday declared that County Assessor Welch never had authorized the statement credited to have come from his office that the erection of the proposed All Saints parish school at East 39th street and Laddington court would depreciate property in the neighborhood 50%. "I have been informed by County Assessor Welch that no such information was given out from his office by his authority, and that if such a statement was made by any of his deputies, it was wholly unauthorized," Mr. Lusk said. The statement was made before a meeting of the city council last Wednesday, at which time the proposed school was being considered, by John A. Murray, one of the residents of the community opposed to the school. "The falsity of the statement is demonstrated by the history of the assessment of Mr. Murray's property," Mr. Lusk said, after declaring that churches and schools were on a parity. "Mr. Murphy's property is directly across the street from All Saints church. If schools depreciate the value of property so do churches. "Mr. Murphy's land was assessed at $1200 in 1916. The church was built in 1918. The assessment rolls show no sudden falling off in the taxable value of his property after taxable value of his property after the church was built. Today his land is assessed at $1450, or $250 more than prior to the erection of All Saints church." Mr. Lusk also questioned the statement of O. Laurgaard, city engineer, that the late Archbishop Christie was opposed to the construction of a school on this site. "Those who were in his confidence knew nothing of any such opposition," Mr. Lusk said in discussing the reputed opinion of Archbishop Christie," and I suspect that neither does Mr. Laurgaard, but that he is merely repeating what he has heard from someone else whose sources of information than his own." Under the city zoning ordinance schools and churches are banned from class 1 and 2 unless the council shall declare in a particular case that the maintenance of a school or a church within a residence district is not inimical to the public welfare, Mr. Lusk pointed out. 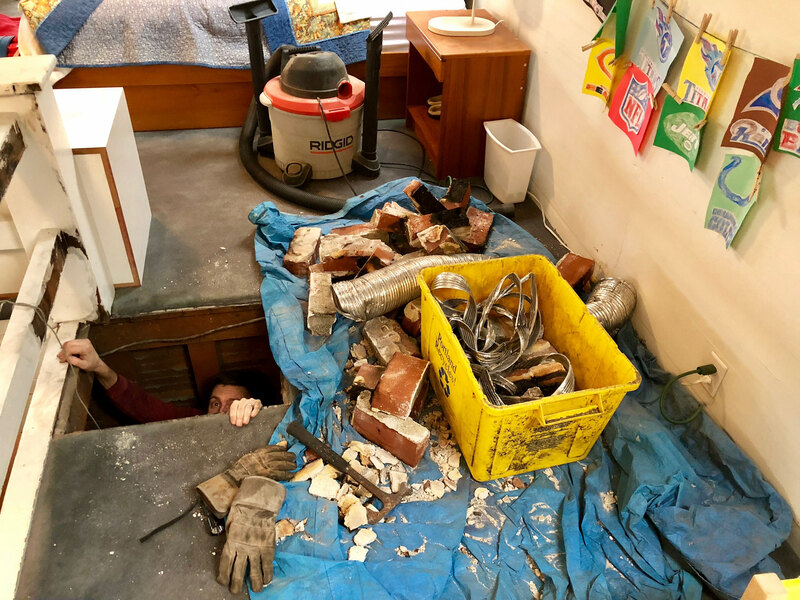 "The city council up to this time," he said, "exercising a wisdom greater than that of the ordinance has only in one instance as far as my knowledge goes, refused a permit for the erection of a school in a residence district." 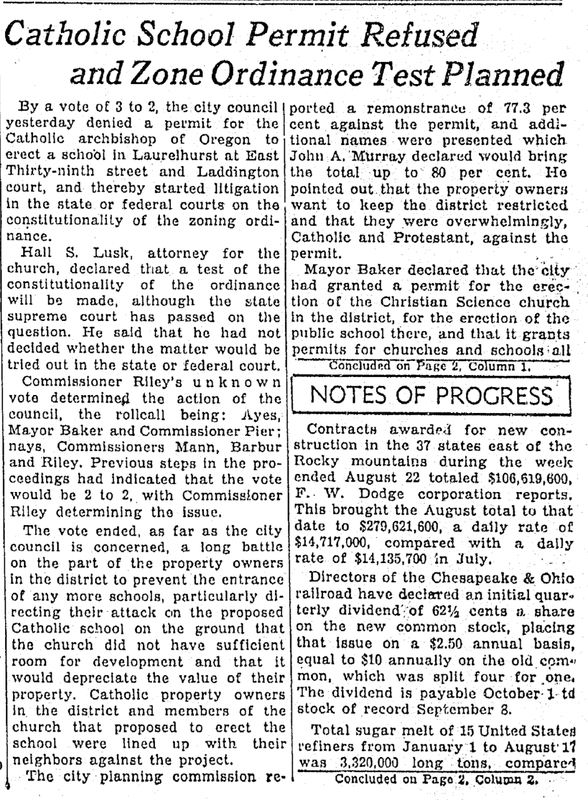 By a vote of 3 to 1 the city council yesterday granted to the Catholic church a permit for the construction of a school in Laurelhurst over the protest of 73.8% of the property owners. 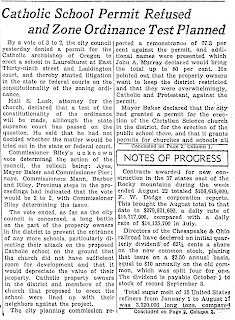 Commissioner Mann voted against the permit for the school, saying that he would grant a permit to any church any place, but that he believed that a school was a different matter. The school will be erected at East 39th street and Laddington court, which property owners in the district declared was not a property place for a school; that it would depreciate their property; that it was not needed and that children would be endangered because of the busy traffic arteries in that neighborhood. Hall S. Lusk, for the church, denies that the late Archbishop Christie had not favored a school there, and said that there was no authority for the statement that the county assessor believed the school would depreciate property. He said property in the neighborhood of another school had increased in value. 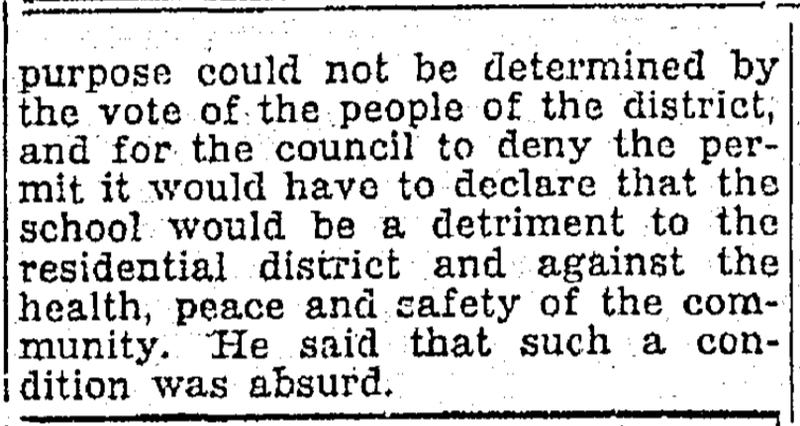 He also said that, if the council denies the permit, the Catholic people of the city would feel like they were being discriminated against because of their religious, although the property owners denied any religious opposition and pointed out that some Catholics in the district were opposed to the school. A delegation representing arroximately 80% of the property owners and residents near the site of the proposed parochial school at East 39th street and Laddington court will present a protest against building the school there tomorrow at 10 o'clock before the city council, according by J.A. Murray, 175 East 39th street North, and Morris Taylor, 1121 East Glisan street, representatives of the remonstrants. "We wish to keep commercialism out of Laurelhurst Park, where the property owners pay 50% more taxes than those in any other unrestricted distrct in the city for this protection," said Mr. Taylor yesterday. "We are not opposing the proposed erection of the school for religious reasons. Depreciation in property value would be one of the effects of placing a school here. And if one school comes in, what is there to prevent another from moving in? If it were a church, it would be all right." They also maintain the erection of the school there would cause complications on two main arteries of traffic and that the church has insufficient room for such an improvement. By a vote of 3 to 2, the city council yesterday denied a permit for the Catholic archbishop of Oregon to erect a school in Laurelhurst at East 39th street and Laddington court, and thereby started litigation in the state or federal courts on the constitutionality of zoning ordinance. Hall S. Lusk, attorney for the church, declared that a test of the constitutionality of the ordinance will be made, although the state supreme court has passed on the question. He said that he had not decided whether the matter would be tried out in the state or federal court. Commissioner Riley’s unknown vote determined the action of the council, the roll-call being: Ayes, Mayor Baker and Commissioner Pier; nays, Commissioners Mann, Barbur and Riley. Previous steps in the proceedings had indicated that the vote would be 2 to 2, with Commissioner Reley determining the issue. The vote ended, as far as the city council is concerned, a long battle on the part of the property owners in the district to prevent the entrance of any more schools, particularly directing their attack on the proposed Catholic school on the ground that the church did not have sufficient room for development and that it would depreciate the value of their property. Catholic property owners in the district and members of the church that proposed to erect the school were lined up with their neighbors against the project. The city planning commission reported a remonstrance of 77.3% against the permit, and additional names were presented which John A. Murray declared would bring the total up to 80%. 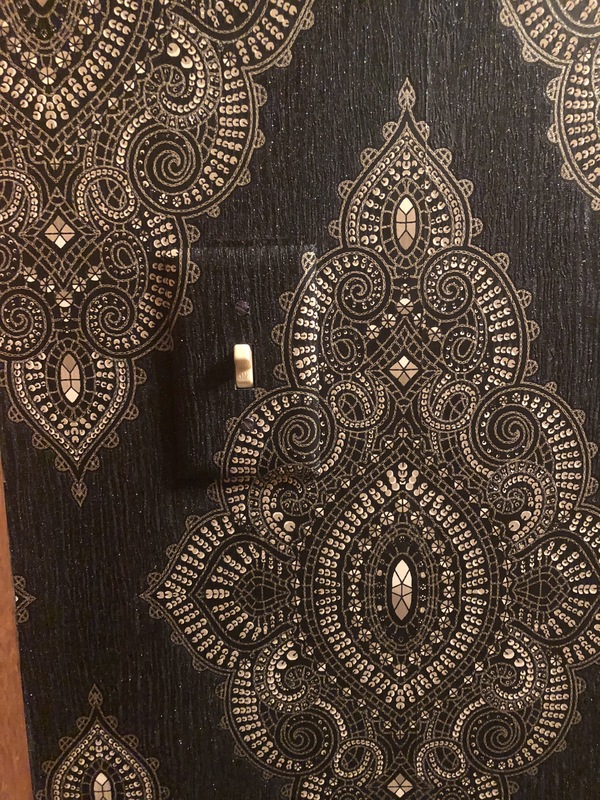 He pointed out that the property owners want to keep the district restricted and that they were overwhelmingly, Catholic and Protestant, against the permit. Mayor Baker declared that the city had granted a permit for the erection of the Christian Science church in the district, for the erection of the public school there, and that it grans permits for churches and schools all over the city in residence districts. He said that denial of a permit to the Catholic church would be a denial to a group of citizens of the same rights that had been granted to others. 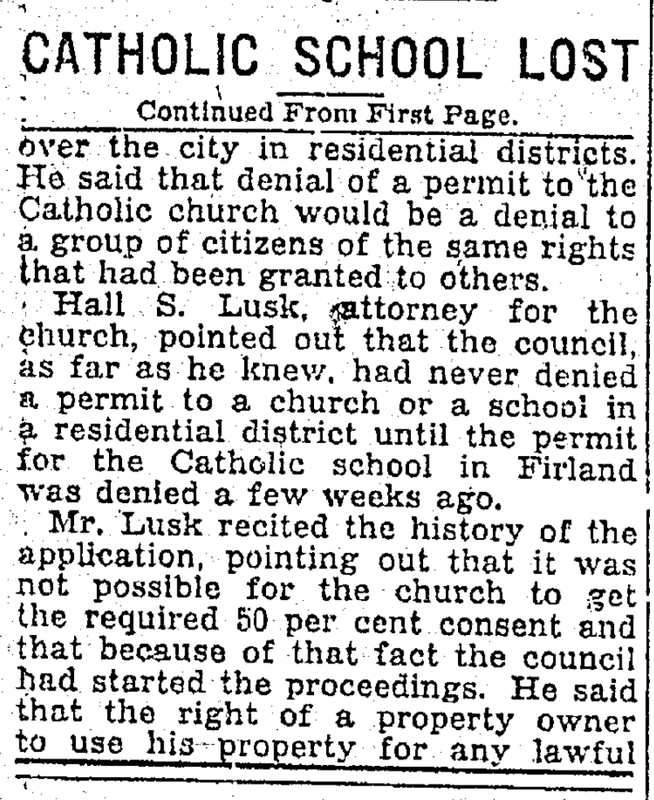 Hall S. Lusk, attorney for the church, pointed out that the council, as far as he knew, had never denied a permit to a church or a school in a residential district until the permit for the Catholic school in Firland was denied a few weeks ago. purpose could not be determined by the vote of the people of the district, and for the council to deny the permit it would have to declare that the school would be a detriment to the residential district and against the health, peace and safety of the community. He said that such a condition was absurd.